I spend a huge amount of time wandering the streets of Barcelona due to the exercise requirements of my dug, Tommy. He was rescued from the dog home in May 2010 and took my wife’s name, Burns as we got him on the 2 nd anniversary of Tommy’s death. He’s now 15 months old and needs a power of walking to tire the fecker out.. I live near Montjuic Park and have reasonably easy access to the main tourist areas. I often get asked for tourist information so I thought I’d combine the walks with El Dug and tourist info. I’ll focus on places that may not appear on the guide books and will try and keep to places that won’t break the bank. First thing is that you will need a wee bit of tourist Spanish i.e. how to order a sandwich and Cava Rosado, this is because the surly chaps behind the counter don’t do any languages other than Catalan or Spanish. The format of this place is rough and ready to put it mildly, it is always utterly rammed, there are no seats so if you are looking for a comfortable eating experience forget it. You will get bumped, bashed and homicidally annoyed, especially if backpack laden Americans have found the place. The food is basic and, most importantly, largely deep-fried. The rule is that you have to order two plates of food or two sandwiches and they will serve you a bottle of cava. The scran is between 2 and 4 euro a plate and the cava is 4 euro a bottle. I’d strongly recommend getting a plato mixto which is a deep-fried selection of chorizo, morcilla (local black pudding) and local sausage. The other plate I’d recommend the cheese as it is fantastic with the cava rosado. So, for two people you will get a decent feed and a nice wee glow for around the ten euro mark. 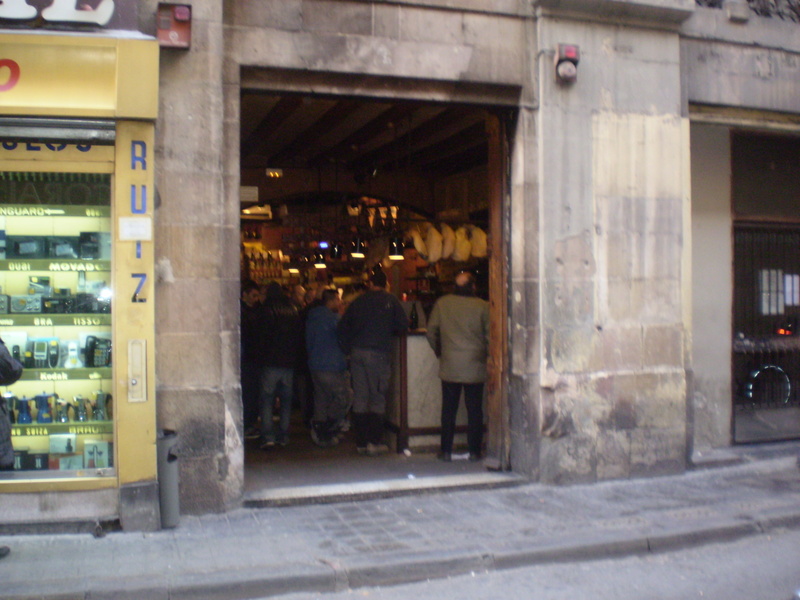 This entry was posted in Cheap food, Ramblas area and tagged Ramblas. Bookmark the permalink.